Onda the Chinese tablet manufacture has this week announced a new addition to their range of tablets in the form of the new Onda V818 Android tablet. The Onda V818 tablet is equipped with a 7.9 inch screen sporting a resolution of 1024 x 768, and is powered by Allwinner A31S quad-core processor, supported by 2GB of RAM. Graphics on the Onda V818 tablet are handled by PowerVR SGX 544 graphics chip, and it comes supplied with 16Gb of onboard storage. The Onda V818 is also equipped with a 5 megapixel front facing camera for video calling, and comes supplied running Google’s Android 4.1 Jelly Bean operating system. 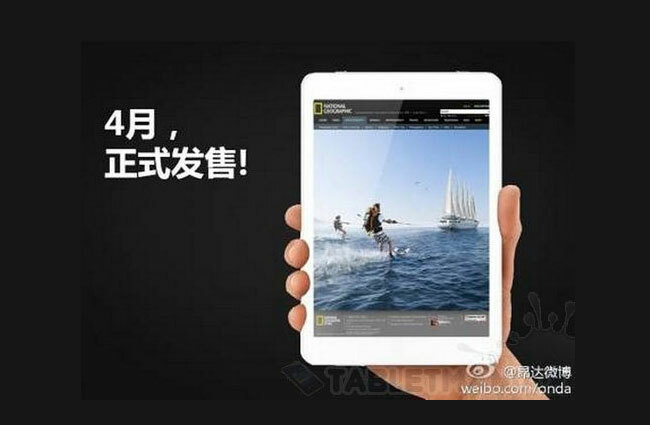 The Onda V818 tablet measure just 7.9″ x 5.5″ x 0.3″ and is a similar size to Apple’s iPad Mini tablet. Unfortunately no information on worldwide availability has been released as yet, but some sites are advertising the Onda V818 tablet for $170 yet the stock is still not available as yet.